Mud daubers are wasps that use mud to construct their nests. Southeast Wisconsin has three types of mud daubers: the organ-pipe mud dauber, the black and yellow mud dauber and the blue mud dauber. The organ-pipe mud dauber builds cylindrical tubes resembling pipe-organ pipes. 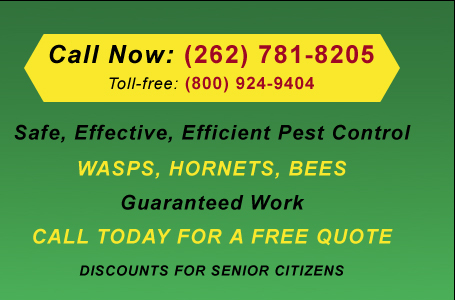 The wasp is 1/2″ to 3/4″ long, shiny, black, elongated and slender. It uses mud to build tube-like, parallel rows of cells as a nest. Nests are usually found on horizontal faces of walls, cliffs, bridges and overhangs. 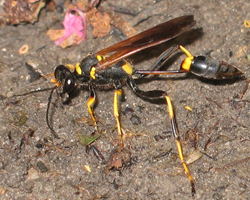 The black and yellow mud dauber builds a group of tube-like cells that are eventually plastered over with mud to form a smooth mud nest about the size of a fist. 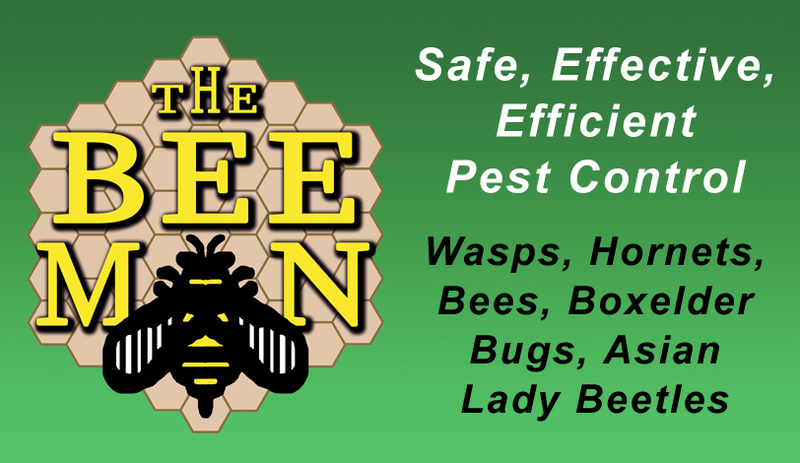 The wasp is 1″ to 1-1/4″ long; black or brown with yellow markings (partially yellow legs) and thread-waisted. The nest of the black and yellow mud dauber is placed on the undersides of boards, logs, rocks, etc. Nests may be a single cell or several cells placed side by side. This nest will look more like a clump of mud than tubes. The blue mud dauber is a beautiful metallic blue with blue wings. They are 1/2″ to 3/4″ long, metallic blue to blackish or greenish (with blue wings) and thread-waisted. The blue mud dauber does not build its own nest, but rather takes over abandoned nests of the black and yellow mud dauber. All three species may occupy the same sites year after year, creating large numbers of nests. Though the three types of mud daubers differ in their nest building strategies, they all use spiders to feed their offspring. The queen wasp paralyses spiders with her sting and packs them into a cell. When the cell is full, she lays one egg in the cell (on a spider) and seals the cell never to return. The larvae that hatches, consumes the spiders until it is fully grown. Developing young will survive the winter in the nest. Although mud daubers are quite intimidating, they are not aggressive. They are also very beneficial by controlling the spider population. They will not usually sting unless mishandled or stepped on. Unless the wasps or their nests are a nuisance, it is not usually necessary to exterminate mud daubers. Please call our office for more information.